​Our office hours are 8:30AM - 4:30PM. Please call 540-308-1247 or email lindsay.mcparksrec@gmail.com. **If the office is locked during office hours, we are out running errands and will return shortly. Head to the Parks and Rec Office at Hoover Ridge, use the automatic ball dispenser and purchase the size basket you want and then head over to the range for your evaluation. Cost is $5 for 35 balls, $10 for 100 and $15 for 155. Cash only! Also, machine does not give change so be sure to have correct change only. Want to try out golf but don't have equipment? No problem! Thanks to a donation by a great Madison County resident, there are clubs available to use. All decisions during the week will be made and posted by 4:00PM by our PRA staff. After 4:00PM, the decision will be made by the coach, keeping in mind the safety of our players and maintaining good field conditions. Saturday decisions will be made by 7:00AM and posted on our website and Facebook page by 8:00AM. Commissioners will be e-mailed and are responsible for contacting coaches, who are responsible for contacting participants. If you do not hear anything on your particular sport or field, all games/practices are on as scheduled. Be sure to check website and Facebook for most up-to-date information. All decisions AFTER 8:00AM Saturday, including Sunday games/practices, are up to the Commissioners of the sport. Soccer plays in the rain, but Baseball/Softball volunteers can get fields cleaned up and dried very quickly! ​All dogs must be on a leash at Hoover Ridge Park with the exception of an off leash area designated on the map. We also ask that you clean up after your pet and have dog waste bags and trash cans on site for your convenience. Thanks to Erin Carver Grimm for working to update the map for us to show a better illustration of what Hoover Ridge has to offer! 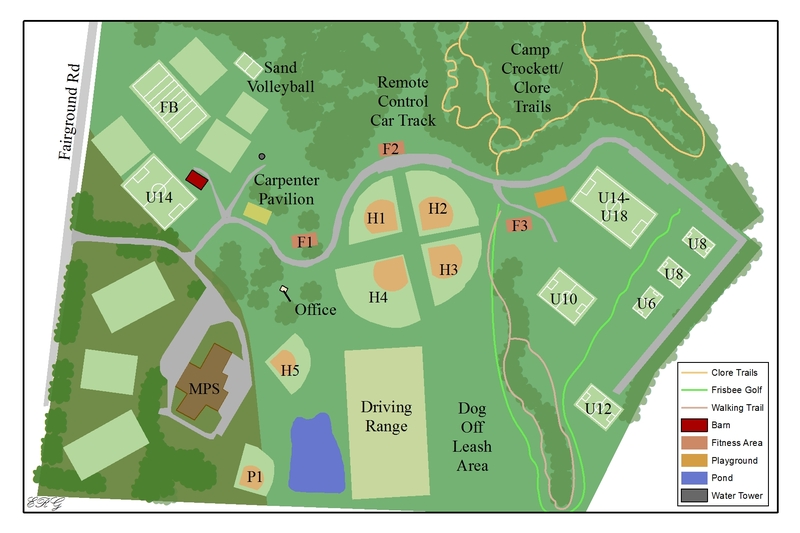 Hoover Ridge is located off of Fairgrounds Road in Madison (GPS users--use Madison Primary School Address of 158 Primary School Dr., Madison) If you would like more detailed directions, email lindsay.mcparksrec@gmail.com or call 540-308-1247. Never miss another event! Subscribe to receive information regarding our programs and events!